Can You Freeze Tomato Soup? | How to freeze your favourite food? Can You Freeze Tomato Soup? Q. I just perfected the best tomato soup recipe, and may have been a bit optimistic about how much of it my family can eat at one time. As a result, I now have a big batch of leftover tomato soup that I would like to save for later. I’ve never made homemade tomato soup before, so I’m not sure about freezing it. I know that tomatoes freeze well, but the soup also has some milk in it, and I don’t think milk freezes well. I would be so disappointed if I froze all that soup only to ruin it in the end. Can you freeze tomato soup? A. Yes, you can freeze tomato soup! Despite the ongoing myth that you can’t freeze foods that contain dairy, tomato soup freezes extremely well. No need to let all that hard work go to waste! However, if you garnish your soup with anything, such as croutons, be sure to remove them before freezing, as they will absorb liquid and go soggy. Other than that, you’re good to go! How to freeze tomato soup? To freeze tomato soup, it’s important to begin with the freshest soup possible. Allow the soup to cool completely before freezing by bringing it to room temperature. Then, decide if you are going to freeze one large batch, or several smaller ones. Soup freezes well in both single serving sizes and larger servings, so it’s really up to your personal preference. To minimize the amount of space the soup takes up in your freezer, freeze it in freezer bags. They can lay flat and be stacked in the freezer. Stand a freezer bag up in a large bowl by folding the edges over the sides of the bowl. Using a ladle or a funnel, pour the desired amount of soup into the freezer bag. Allow about an inch or two headroom to allow for expansion, then seal the bag. Label and date the freezer bag, and then store in the freezer. To use frozen tomato soup, remove the soup from the freezer. Either thaw in the fridge before reheating, or reheat from frozen. Give the soup a good stir to reincorporate all ingredients and to bring it back to its original consistency. The soup can be microwaved or reheated in a saucepan on the stove. 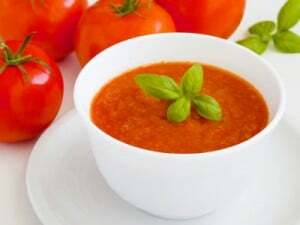 For best results, consume previously frozen tomato soup within a few days of thawing, and never refreeze previously frozen soup.